Ever since I was young (having seen the James Bond film!) I have wanted a Lotus Esprit. Finally I have achieved my dream. I now own this Lotus Esprit sport 350. 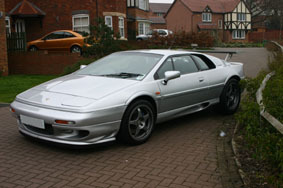 The Sport 350 was a limited edition version of the highly successful Lotus Esprit. Lotus only made 50 of these cars, 8 of which were exported to the USA This is car number 45. It is powered by a Lotus designed and built 3.5 litre V8 twin turbocharged engine mounted just in front of the rear wheels. It develops 350bhp and can accelerate from 0 – 60mph in less than 4 seconds going on to a top speed in excess of 175mph. All but a few were made in this aluminium colour. The rear wing was developed for their GT2 race car and is made of carbon fibre. Part of the dashboard is made of carbon fibre. Lotus built the Esprit for nearly 30 years and each car was hand built. 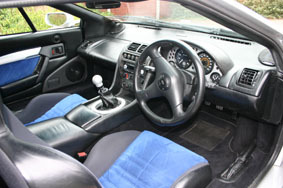 Production stopped in 2004 and a replacement car is currently under development.The sport 350 is based on the standard Esprit V8 but has had a number of changes made to reduce the overall weight.